October was a busy month here at the Academy. 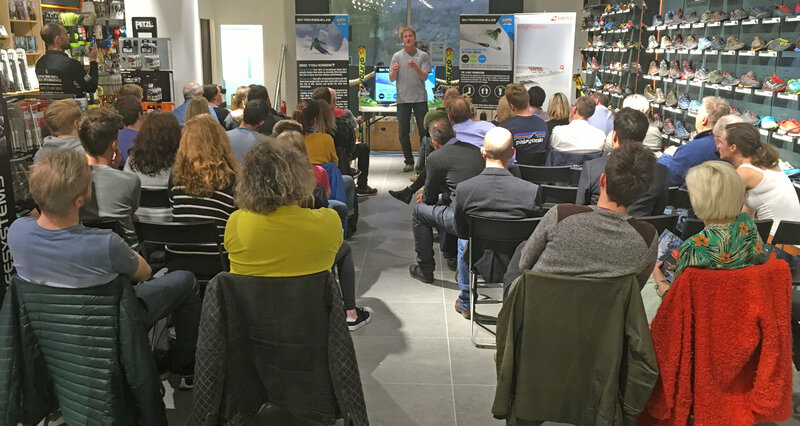 The team have been delivering our Ski Technique Lab talks up and down the country from as far north as Fort William in Scotland to Bristol in the south west of England. 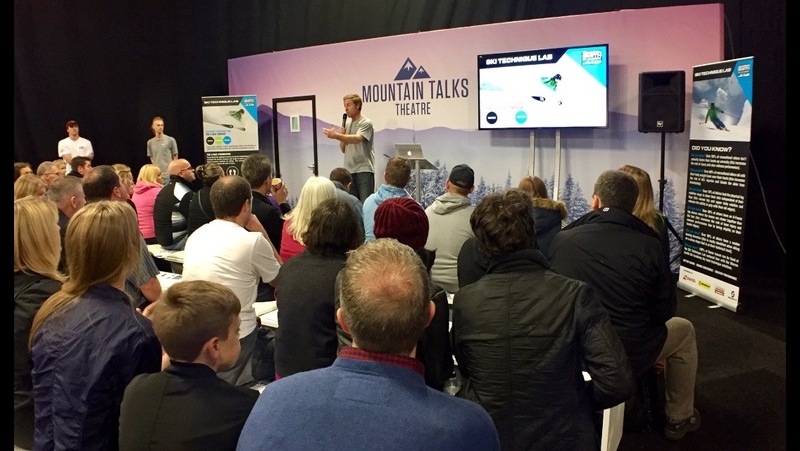 The tour finished at this year’s Telegraph Ski & Snowboard Show at Battersea Park London with a daily presentation at the events Mountain Talks Theatre. This was followed by the chance to participate in our Biomechanics Lab Tests back on our Academy stand. It’s no secret that we have been running these tests on our Academy courses for over 12 years. Anyone who has attended will be all too familiar with the 3 way foundation tests. It was these tests that we used with over 1000 people during the tour and by seeing it on a much larger scale we were staggered to see the results that presented themselves. The number of skiers who are skiing with severe physical limitations (range and stability) and inadequate equipment for their level was incredibly disturbing. 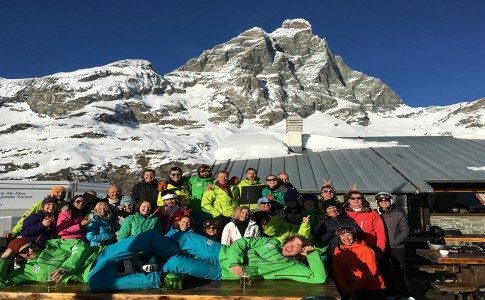 By discovering these problems and coming up with some simple ways to rectify them we believe we have opened up a new chapter in how ski coaching will move into the future. 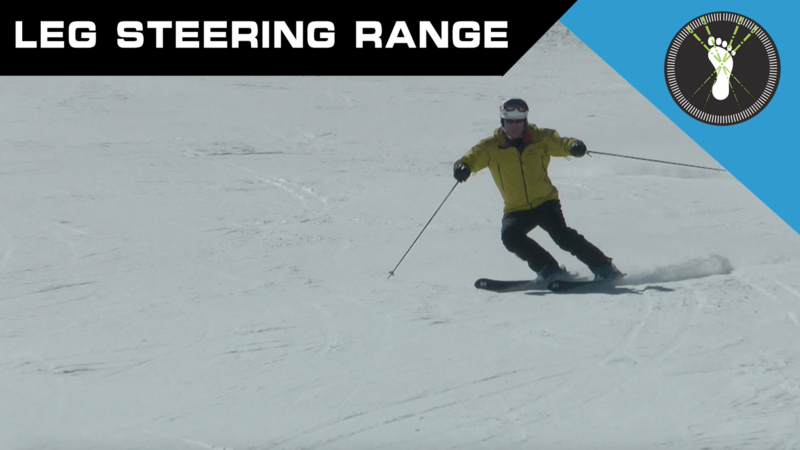 In the 12 years of running these test’s we’ve recognised that certain movements are absolutely fundamental to executing sound and safe ski technique, therefore allowing performance enhancement. 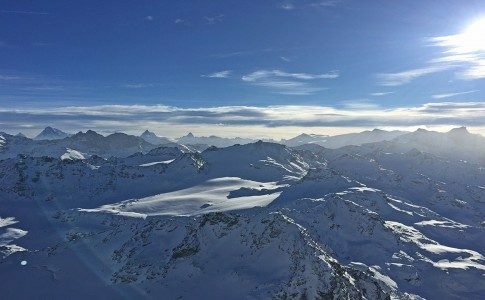 Without this freedom of movement, which should be aided by well fitted and correctly selected equipment, skiers experience blocks and therefore make incorrect and unsafe movements to compensate for the lack of range or stability where needed. The 3 way foundation tests highlight each crucial range of movement and the potential blocks and instabilities they may hold. The ankle joint is the closest major articulating joint to the skis and snow. 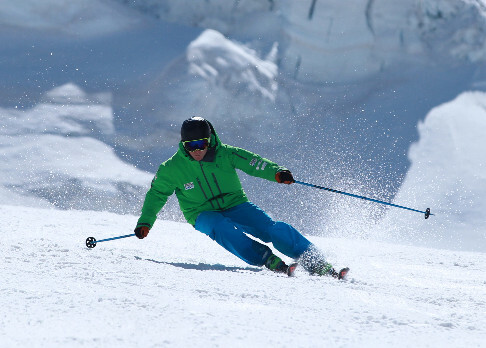 If this joint is allowed to flex correctly the power transfer to the ski is both efficient and effective whilst allowing the skier to maintain good center balance. The success of this movement can be determined by two factors. 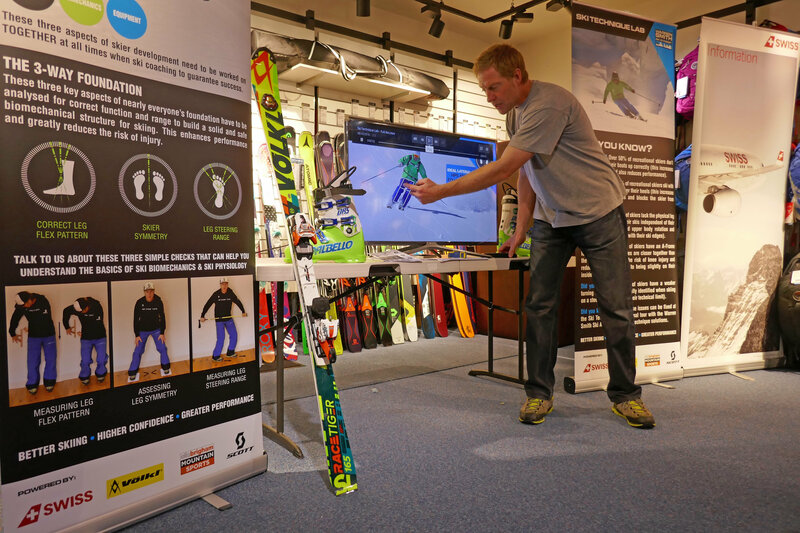 Firstly the ski boot itself must be fitted correctly with accurate canting and footbeds provided. It must also have the correct flex rating relevant to the skier’s weight and level. 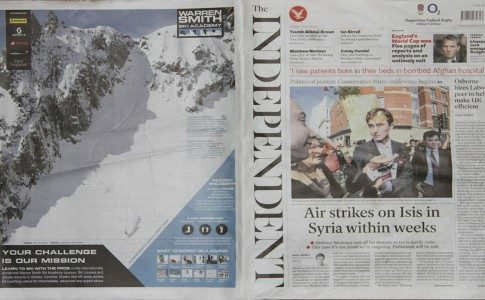 Secondly the skier’s personal physiological limitations must be considered. If the skier has limitations in the calf muscle or the joint itself this will play a huge role in how the movement can be applied on the mountain. This is where our ‘Drop Tests’ comes in. By taking a measurement of how far each person’s ankle allows them to flex, we can tell early on if the simple mechanics of the sport will work or not. 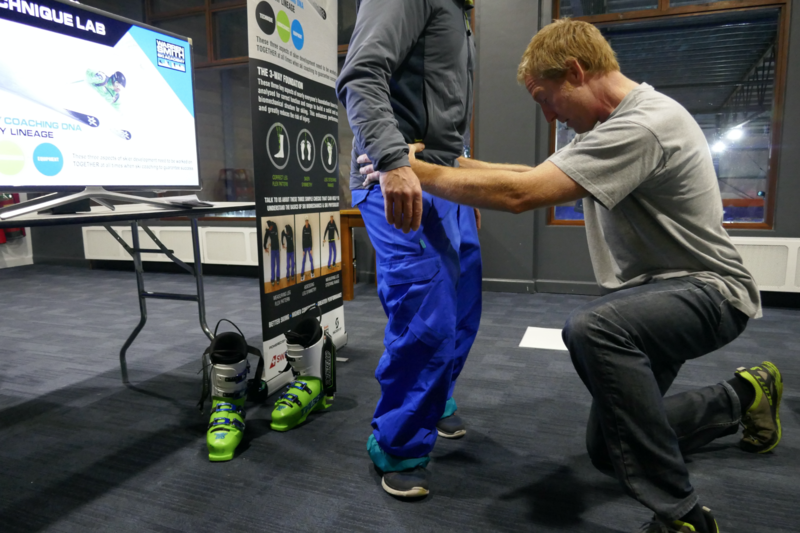 The ideal range for safe skiing on the drop test is between 15cm and 20cm with the same flex range on the right and left ankle. 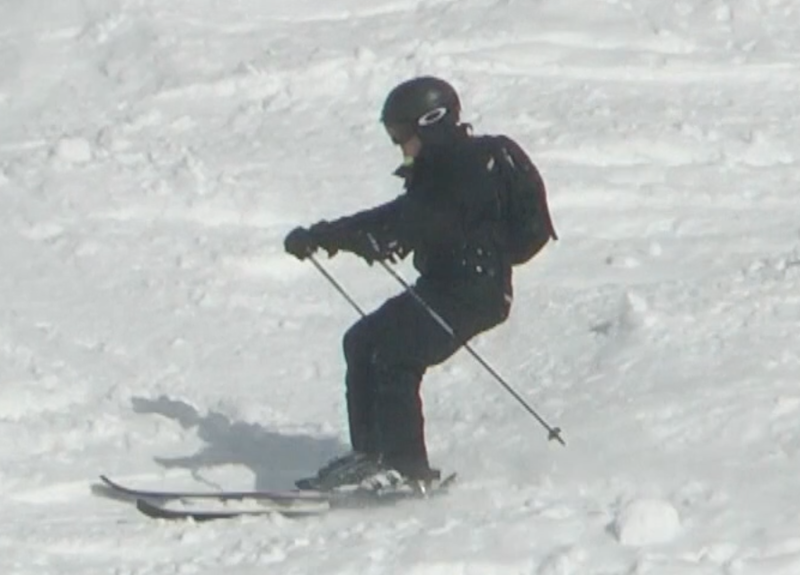 Skiing without ankle flex in the common ‘back seat’ position. 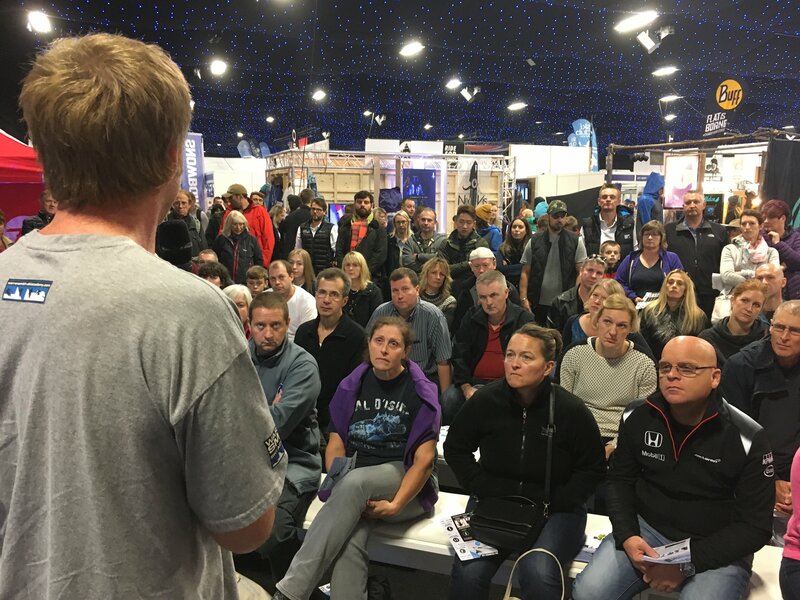 Of the hundreds of people tested we were astonished to see the huge difference in ranges. Our lowest score was a worrying 4cm and our largest score was a huge 35cm. The key factor was the average score was 11cm drop before a heel lifted on either side. Despite this 95% of people tested had a clear difference between their left and right ankle joints, meaning one heal would lift off the ground before the other. To rectify these flexibility issues each person was given some basic stretches to work on over a period of 3 weeks and encouraged to keep the Academy up to date with their progress. The key to success was to keep in contact and help monitor the change in the scores. We’ve already had over 100 people writing in with score updates that are very different to 3 weeks ago. Ultimately they will go away with a much better ability to flex their boots and also reduce the risk of injury should there be a sudden impact or compression. 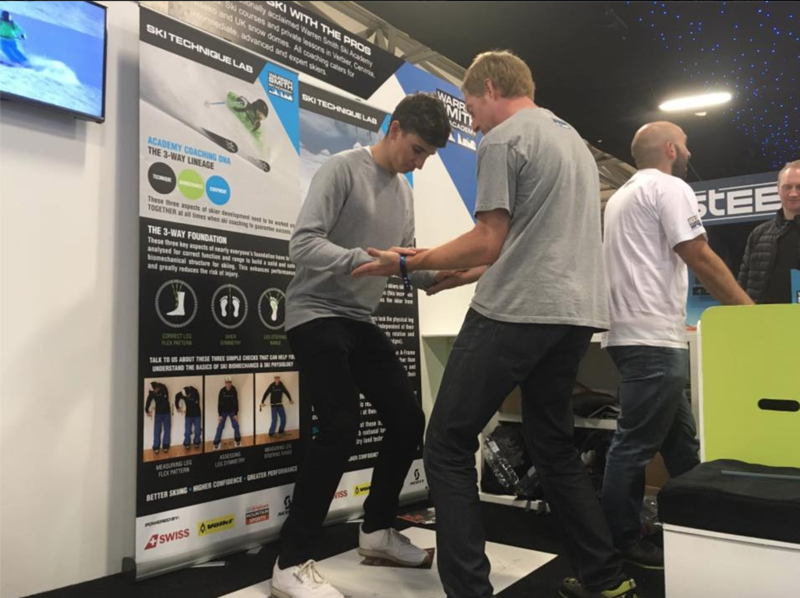 Warren Smith delivering the ankle flex drop test during the UK tour. 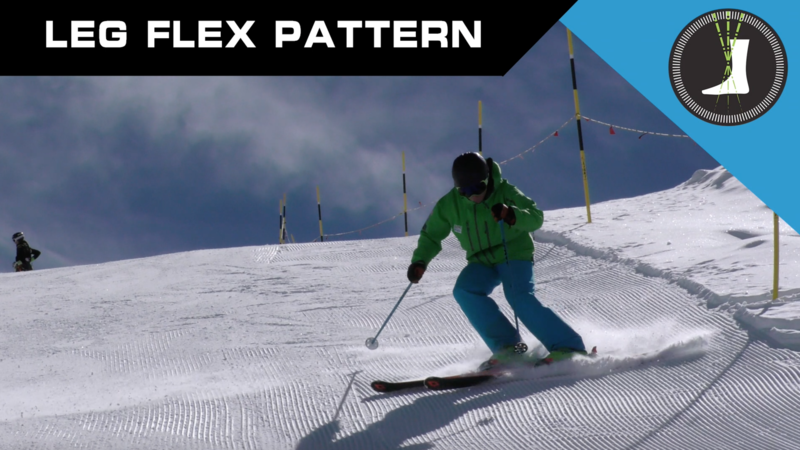 Lateral control is easily translated as how skiers manage their width of stance from the feet up to their hips and maintain a consistently symmetrical position, primarily controlling where the knees move inwards and outwards between the hip and foot. Many skiers don’t think of this axis of movement as one that actually exists. In your minds eye your knee is a simple hinged joint that only moves through a forward/backwards plane of movement and won’t move laterally inwards. However, if you were to stand in a ski position, 20cm to 30cm apart, you’ll quickly see that your knee can move inwards and to quite a degree, certainly enough to affect your skiing technique. Controlling this range isn’t an easy thing to just switch on. 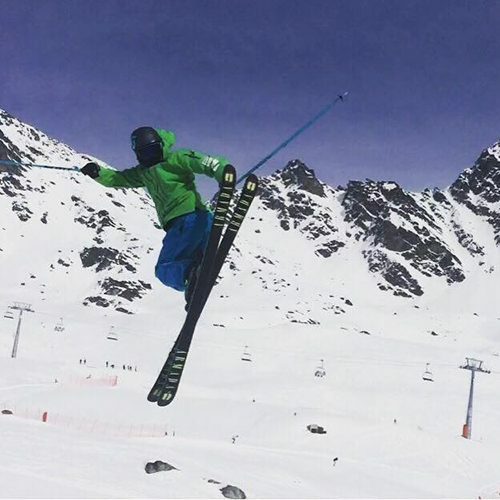 Specific muscle groups including the Adductors and Gluteus Medius need to be activated whilst skiing to maintain symmetry, not allowing the legs to fall into the all too common A-Frame. This is where the knees collapse in, feet split wider apart or both together. A loss of symmetry can result in a much higher risk of knee injury due to being asymmetric. Your skis will also be riding at slightly different angles so following a different trajectory, making your turns feel like a fight rather than flow, especially in the more challenging off piste conditions. The 10 second test is a simple way to effectively strengthen and improve lateral control. 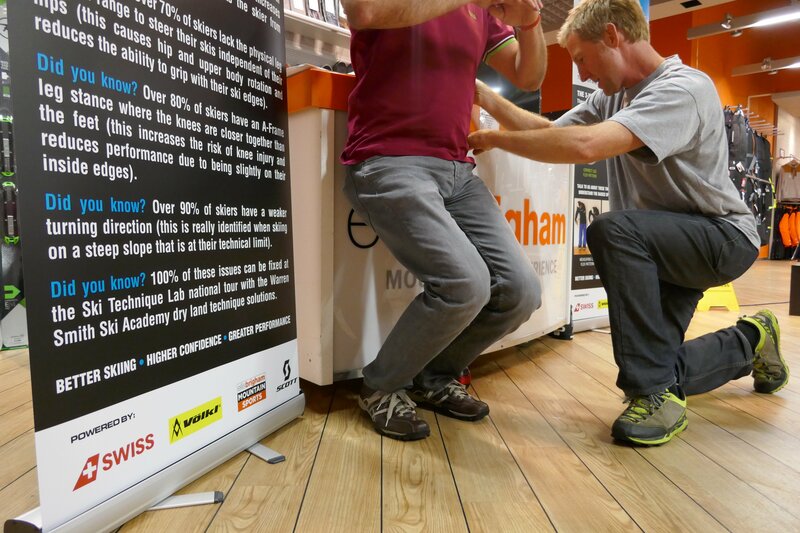 The test requires a slippery surface and a stance width of approximately 80cm. The task is to, over a period of 10 seconds, pull both feet together at a matching rate without letting the knee’s drop together. The results were again interesting. Over 70% of people had to have 3 attempts to make it last 10 seconds or more. The natural movement was to ‘unweight’ the feet and make a fast retracting movement. Even the remaining 30% of people who were able to slowly pull the feet together showed that it was a very underused movement as the legs would visibly shake under the effort. This was evident in all levels of skier from less experienced skiers right up to members of Team GB. See the below picture of Half Pipe athlete Peter Speight participating in the10 second test. Warren Smith putting Team GB athlete Peter Speight through the 10 second lateral control test. It was explained to everybody tested that is was normal for the legs to shake as this axis of movement isn’t used in day to day life. Only 6 people out of over 1000 managed to do the test without lateral leg shake first time. Everybody was given the task of practicing the test for 3 weeks and monitoring the results of the leg shake. Responses to the practice have been excellent so far and nearly everybody noticed the reduction of leg shake even after 1 week. 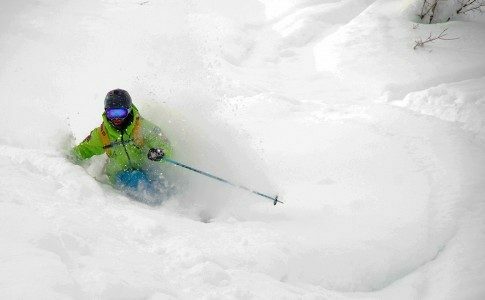 Once again, a basic, easy to use at home exercise, having a direct effect on a skiers technique and consistency. 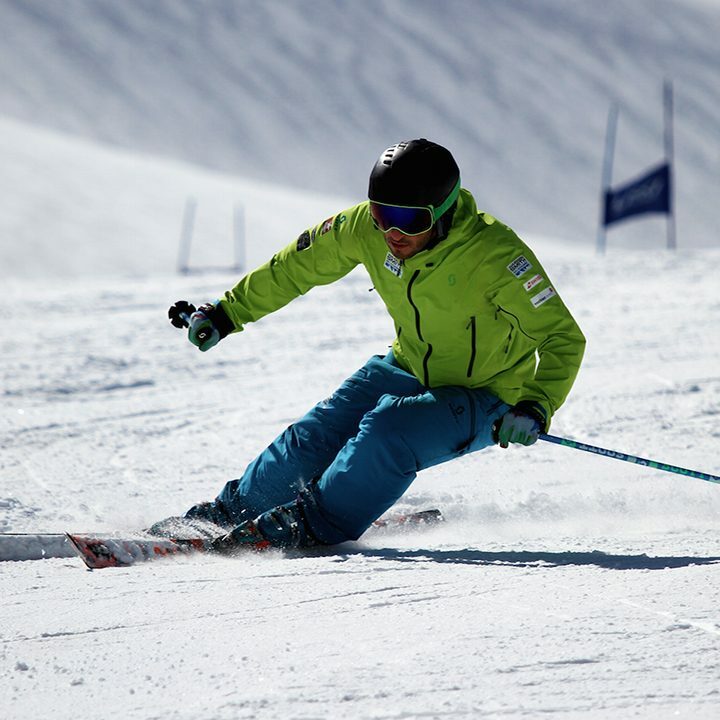 The ability to steer or rotate inwardly the outside leg of a turn (right leg when steering left and left leg when steering to the right) is one skiing’s fundamental movement ranges needed. This is simply the ball rotating inside the socket joint of the hip. Unfortunately, this range is restricted with many skiers and not being able to inwardly rotate to approximately 70 degrees across the fall line directly affects your skiing technique. This is most apparent in the sports short game, i.e. 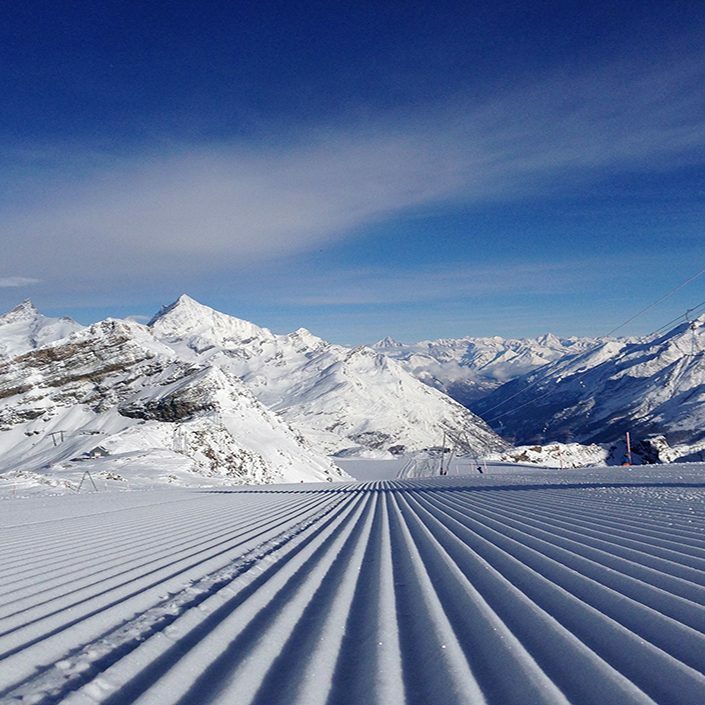 shorter radius turns, moguls, steeps, couloirs, tight spaces. They all highlight the major problems that occur when the legs only steer to a limited degree independent of the hips. 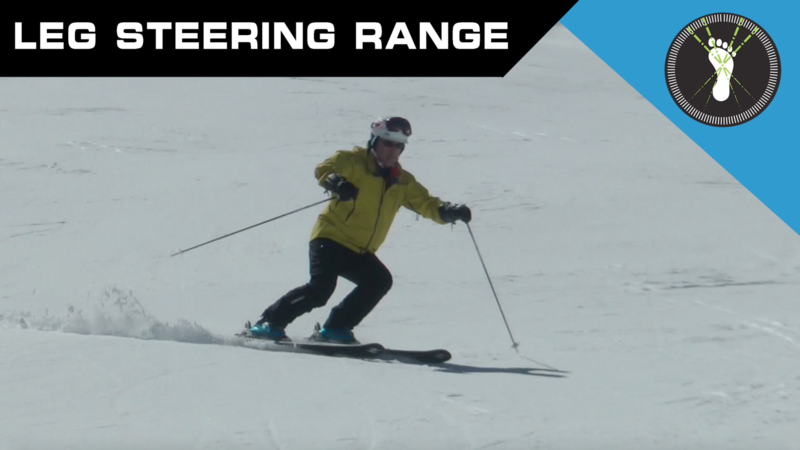 The consequence of this limited range in steering is that the whole pelvic girdle will rotate (also guarantees upper body, shoulders and arm rotation), which will move towards flattening the edge angle of the ski’s and putting some of the body weight on the inside ski. 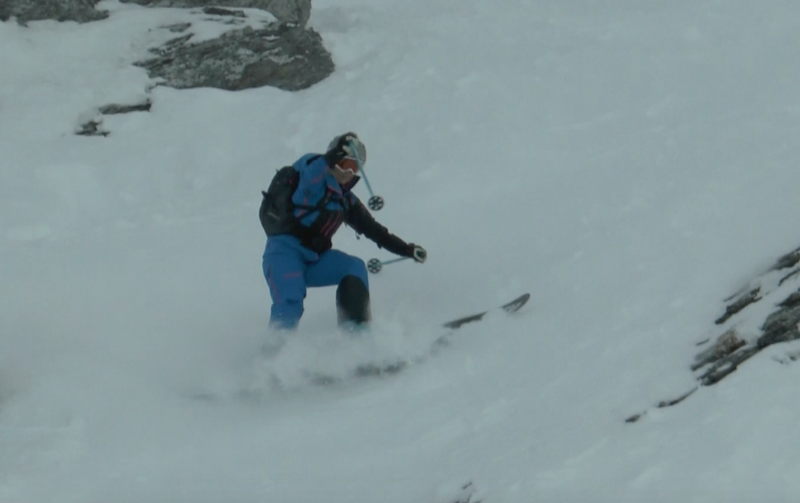 This will ultimately end with an over rotation from the whole upper body and a loss of grip against the outside ski. In these short game situations this can seriously disrupt the flow of the run and depending upon the surroundings may be dangerous to the skier. Hips and shoulders rotating resulting in a safe platform being lost in a steep tight area. From our on mountain analysis of this particular movement we have been able to estimate that to make a technically sound turn in a narrower corridor situation even on a blue/red run a skier must be able to steer each leg within the hip socket to a minimum of 70 degrees across the fall line to have any chance of performing the sport technically correct. By putting people through our leg steering range test we are able to measure the natural range between left and right turns. Warren performing the leg steering range test on a tour participant. The nationwide results from these tests were hugely varied and quite alarming. The average inward rotation range over more than 1000 people was 45 degrees. 90% of people showed over a 20 degree difference between left and right and only 5% of people tested showed a clear range of 70 degrees in each direction. Some rotation scores were under 20 degrees which will make skiing progression near on impossible and also increase the risk of injury considerably. 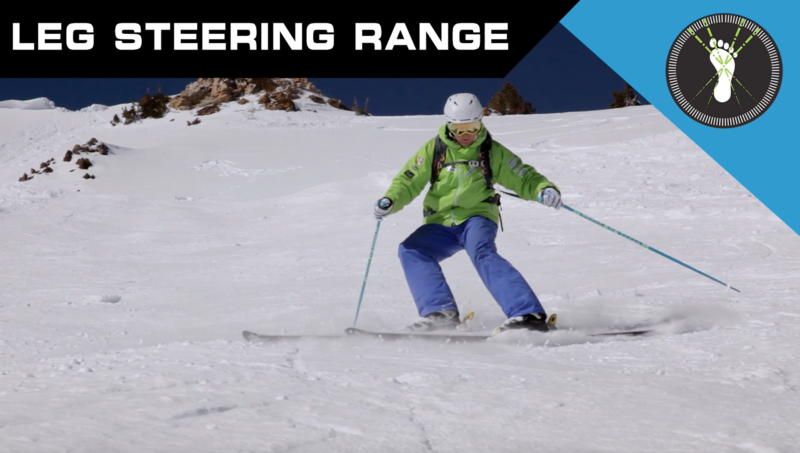 So overall most people didn’t have the range needed to ski technically correct and most also showed that they have a big difference between left and right. 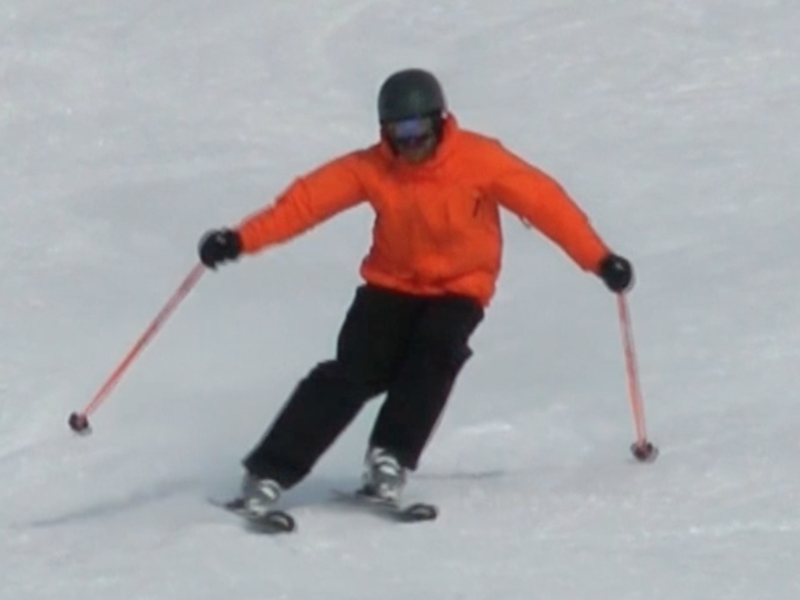 The same skier showing clear leg steering on the stronger turning direction. All participants were once again given a detailed explanation of the reasons for this. Most of it coming down to the fact that inward rotation is not used much in day to day life so that way why the scores were so low. Simple and effective use of the range will get it firing and working for you. Putting a ski pole across the hips and simply practicing the range was the main thing people took away and started working on. The other was a stretching program working on particular muscles including the Piriformis and Gluteus Medius that if tight will reduce the ability to rotate inwardly. We’d like to take this opportunity to thank everyone who attended either our Ski Technique Lab tour at Ellis Brigham Mountain Sports stores around the country or the Telegraph Ski & Snowboard show and urge you to send in your lab test scores from the below sheet along with some other vital pieces of information so we can begin creating our individual skier profiles for the Academy database. 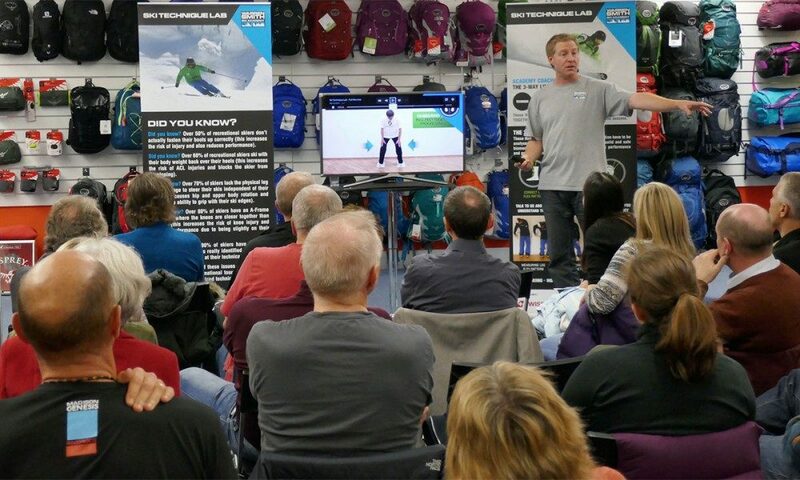 This information will help create the first skier database of its kind and help both coach and skier develop improvement and performance. Simply write to the team with the subject heading of Academy Skier Profiles and fill the message body with the following info. Leg Steering Range Test – Turning right Degs? Turning left Degs? THE AUTUMN COMPETITION RESULTS ARE IN!